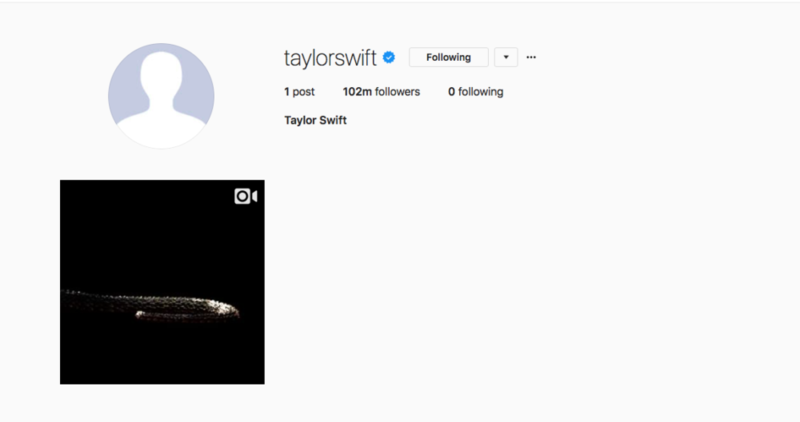 Something is happening on Taylor Swift’s social media channels. A buzz is in the air, an eclipse is in the sky, and Swift just uploaded a snake (?) to her social media channels. Last week, Swift wiped her social channels. Which included deleting every post, her avatars, her bio, and unfollowing everyone. Now, the rebuild begins. We can’t even imagine what musical era this gif of a lizard tail would mean. But here it is — feast your eyes on the snake/dragon (?) thing that Swift uploaded to social this morning. Our only explanation is that more music is coming — what else could this mysterious blackout mean? Swift released 1989 on October 27, 2014. What we’re trying to say is that it’s been 3 YEARS without new music, so whatever serpent she just uploaded to social must signify her new musical era or at least a new single. The only thing we can ~think~ this might relate to is the popular social media diss of leaving the snake emoji () in the Instagram comments of someone or something you dislike or distrust. Being a very famous and very public person means more than your fair share of haters, and unfortunately, Swift has been targeted by the snake emoji comment spree before. Maybe this new song is her reaction to that? Swift is never one to shy away from those who critique her and gladly speaks her mind through song. We’re intrigued and desperately waiting to find out.